Nyx is the Greek Goddess of Night. She is its personification, and therefore, can be represented by a veil of dark mists although she is more often than not depicted as a beautiful woman clothed in dark robes, wearing a long veil on which shine the stars. Another one of Her representations in ancient arts would be a winged goddess. She rides a chariot pulled by two to four horses as She covers the light sky with Her darkness and leaves the stars in Her trail. 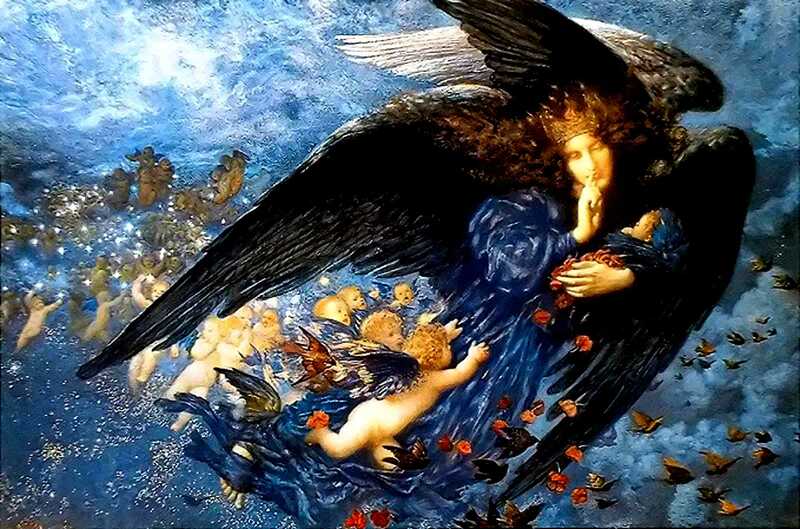 Two of Her sons accompany Her on Her journey: Hypnos (God of Sleep) and Thanatos (God of Death). Daughter of Chaos, She is older than Her sister the Earth Gaia, as She was one of the first born elemental gods and goddesses who ruled over confusion in the void of emptiness. She married Her younger brother Erebus, with whom she conceived Aether (God of Light) and Hemera (Goddess of the Day). Then later, on Her own: Moros (Doom), Ker (Destruction), Thanatos, Hypnos, Momus (Blame), Oizys (Distress), the Hesperides, the Moirai (Fates), Nemesis (Divine Retribution), Apate (Deceit), Philotes (Friendship), Geras (Old Age) and Eris (Strife). As we can see, Nyx was the mother of many children, for whom She cared deeply and fiercely. During the day, She nurtured them in their home, located in Tartarus, in the depths of Hades' Underworld. When the evening starts, She leaves Her house, as Hemera enters it, to start Her journey and grant the world some rest after the day. Nyx is like every other goddess, either helpful or harmful to mankind, although She is a bit more extreme. Indeed, She can bring either sleep or death depending on the situation. But in the dark of the Night, many frightful and inexplicable things can happen; hence, why She has also been attributed the power over illness, suffering, dreams, misfortunes, quarrels, war and murder. Knowing that, we can understand that the people most devoted to Her were thieves and fugitives as well as lovers. Nyx is also the supreme ruler of prophetic power. According to Greek traveler and geographer Pausaias, She had an oracle on the Acropolis in Megara. But still, She was rarely the focus of cults. If you were looking for Her, you could see Her lurking in the background of other cults. Thus, there was a statue called Nyx in the temple of Artemis at Ephesus. The Spartans also had a cult of Sleep and Death, conceived as twins. So, when She is not forgotten, Nyx is seen as a malevolent being. But if we choose to look past this, we most certainly can recognize Her power and Her sense of motherhood. A good example of that can be found in the Iliad. During the Trojan War, Hera asked Hypnos to put Zeus to sleep while She led his son Heracles to his death. When he awoke, Zeus was driven mad by the loss of his son and threatened to unleash his wrath on Hypnos. But the God of Sleep fled to his mother's home where Zeus dared not touch him in fear of angering Nyx. Hypnos caused trouble for Zeus a few more times after this incident, but always scurried right back to his powerful mother afterwards. The way Zeus feared Nyx as She was older and more powerful than he may remind us of how the Patriarchy feared the ancient Goddess. Nyx is there to remind us of the immense power that lies within us. She teaches us not to be afraid of it, but to embrace it and to use it to protect those we care for. It is only when we stop being afraid of the darkness that we can see the truth, as it is often hidden. Nyx also reminds us that life is not always bright. It has its share of good and bad, and we must seek balance. 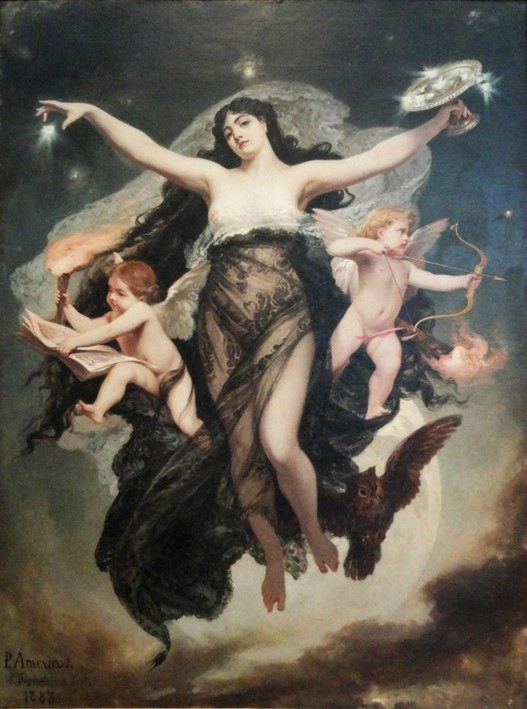 Nyx is most frequently associated with the Moon so the day of the week associated with Her is Monday. Her colors are black and silver. Her symbols are stars on a black veil and a crescent moon. Animals protected by Her are bats and owls, as well as other feared animals associated with the night such as black cats. During the year, Her presence is predominant around Yule, when the nights are the longest. Finally, stones associated with Her are agates, which protect against bad dreams and stress, and most importantly moonstones. Their power is naturally the strongest when it is a full moon. They are believed to be a reflection of their owner and can help women align themselves with the universe and find their path. Since there aren't really any rituals to honor Nyx, I wrote one for this project. This ritual is meant to help you grow more confident as you embrace Nyx, ask Her to help you to see what's hidden, and to not fear the unknown. It should be performed on a Full Moon, preferably outside or by a window, just before going to bed. Being able to gaze at the stars would help a lot, but if they are not visible you can always imagine them. Surround yourself with white or silvery candles to represent the stars that follow Nyx in Her path. For offerings to Nyx, consider flowers that only bloom in the night such as four o'clock flowers, as well as dark fruits such as blackberries, blueberries or plums. Use white sage to purify your sacred space. You can also use lavender to call on to Nyx's child Eros (God of Love) for positive energy and is always a plus when performing this ritual. Also, Eros’ presence will shield you from Nyx's other children who may have a more negative impact. Before starting your ritual, place a veil on your head, as Nyx is associated with the Veil of the Night. Kneel on or in front of a piece of black cloth on which you will place two moonstones to represent and show respect to Nyx's sons Hypnos and Thanatos who always accompany Her. When inviting Nyx to join you, you can chant Lord Byron's poem She Walks in Beauty. When praying to Nyx, hold the moonstones in your hands and humbly ask for Her guidance and Her strength, speak with your heart, trust Her with your fears and hopes. These are your only guidelines. After you have thanked Nyx and Her children by kissing the two moonstones, open your circle by extinguishing the candles. Leave the fruit and flowers outside your window if possible and put the moonstones under your pillow or bed. Nyx may share some of Her wisdom with you through a dream. Remember to release the energy raised during the ritual. You might want to do that by sending it out to the rest of the world or to some people who might need a blessing during the night. All images in this project are public domain.